Launching a book represents a major accomplishment for anyone, and so it deserves a celebration. Like any significant event or celebration, a book launch requires planning: careful arrangements and preparation, for months in advance. An increasing number of authors are seeing the value in using social media campaigns to promote their books. This can be a challenge for those who have not already spent time creating an online presence. Even authors who have established an online community may not know how to strategically leverage and activate their online relationships. It helps to have someone experienced to guide you. In March 2012, Becky Robinson founded Weaving Influence and began to draw together a dream book launch team. Although the team has expanded to support thought leaders, businesses, and nonprofits in using social media, our specialty at Weaving Influence is planning and executing social media book launches. 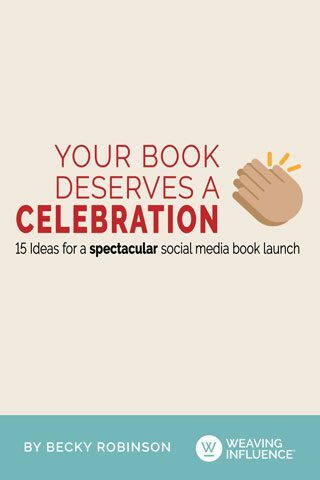 Download this free e-book as a starting point in your book launch celebration. This book will be a great resource to you even before you start writing your book!